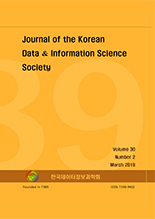 김수빈, 황범석,(2019).고위험 음주 자료에 대한 베이지안 비대칭 로짓 모형 분석.한국데이터정보과학회지,30(2),335-348. 한국 질병관리본부에서 시행된 고위험 음주 발생의 원인과 특성에 대한 자료에서 고위험 음주에 대한 변수는 극단적으로 한쪽으로 치우쳐서 나오는 불균형적인 이진수 자료의 특성을 지니고 있다. 이런 경우 이진수 자료에 대한 대표적인 대칭 모형인 로짓 모형과 프로빗 모형을 사용하게 되면 모수의 추정치가 편향될 수 있다. 본 논문에서는 이러한 불균형적인 이진수 자료를 분석하기 위해 비대칭 연결 모형 중 하나인 비대칭 로짓 모형을 베이지안 추론 방법을 기반으로 사용하였다. 비대칭 연결 모형은 로짓 모형, 프로빗 모형, complementary log-log 모형 등을 포함하는 일반화된 모형으로 부적절한 무정보적인 사전 분포를 사용했을 때 사후 분포의 적절성을 보장해주는 장점을 지니고 있다. 고위험 음주 자료에 대한 모형의 분석결과 비대칭 로짓 모형이 기타 다른 모형보다 불균형적인 이진수 자료를 설명하는데 더 적합하다는 것을 확인할 수 있었다. In the data on the causes and characteristics of high-risk drinking incidents conducted by the Korea Centers for Disease Control and Prevention (KCDC), high-risk drinking variable has features of unbalanced binary data that are extremely skewed. In this case, symmetric link function models including the logit model and the probit model may yield biased estimates of the parameters. To figure out this issue, we used a skewed logit model, which is one of the skewed link models to analyze such unbalanced binary data based on Bayesian inference methods. The skewed link function models, and has the advantage of ensuring the propriety of the posterior distribution when using and improper noninformative prior distribution in Bayesian inference. The analysis of the model on high-risk drinking data showed that the skewed logit model is more appropriate for explaining asymmetric binary data than the other comparing models.